AquA AnimaniA » Pets » Birds » Baby *Handfed* Birds… We Have the Only Baby Cockatiels in Town! ← Find our Logo Contest! Baby Budgies, Baby Cockatiels, Baby Canaries, Baby Finches! 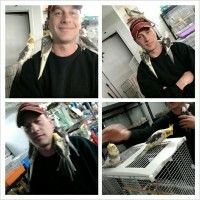 This entry was posted in Birds, Pets and tagged Baby Birds, Baby Budgies, Baby Canaries, Baby Cockatiels, Baby Finches.